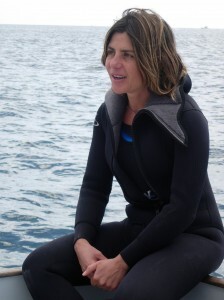 Phycologist Roberta D’Archino says her passion for seaweed brought her to New Zealand seven years ago. Her research is focused mainly on red seaweed and includes morphological observations, molecular analysis, culture work, and diving. She grew up and studied in Italy becoming familiar with Mediterranean seaweed first and for her PhD she studied the algal flora of Kenya and Tanzania. My challenge is to contribute to the documentation of New Zealand marine flora. I am an experienced phycologist and diver. With NIWA I have had the chance to dive in beautiful places like Fiordland, Stewart Island, the Bay of Islands and recently, New Caledonia, but I also often dive in harbours around New Zealand for marine surveillance. It’s exciting to dive here in New Zealand because there is always something new to be discovered and it’s what I am expecting from this trip. My day at work includes time at the microscope which I enjoy the most, as well as writing and reading and often a quick swim during lunch break.